BECS Technology introduces EZConnect, a simple and secure system for providing local and remote access to BECSys controllers. EZConnect employs a multi-layered security approach including TLS encryption and locally generated Authentication Codes, and eliminates the need for IT departments to make special router/firewall allowances for access from outside the network, such as port forwarding and VPNs. EZConnect is currently available on BECSys7, BECSys5 and BECSysBW controllers. Used as a secondary disinfectant system, as recommended by the Model Aquatic Health Code guidelines, HydroRite™ UVO3 delivers a powerful trio of disinfectants—utilizing UV, ozone and advanced oxidants that work synergistically to inactivate more than 99.9 percent of harmful chlorine-resistant microorganisms. 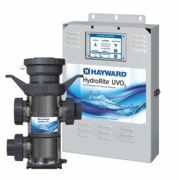 NSF Certified HydroRite UVO3 makes it easier and more affordable than ever to provide your facility the most advanced all-in-one UV and ozone system. The ColorQ PRO 6 handheld photometer eliminates the need to visually determine slight color variations. The photometer is easy to use and features economical liquid reagents that measure 144 tests per test factor for Free Chlorine (DPD), Total Chlorine (DPD), Bromine (DPD), pH and Alkalinity. The Calcium Hardness and Cyanuric Acid tests are measured by using the TesTabs® tablet method and includes 100 tablets for each test. RAMUC Pool Coating Systems develops and manufactures epoxy, chlorinated and synthetic rubber, and acrylic pool and deck coatings. Ramuc's years of experience, coupled with a history of excellent quality products, has established the company's commitment to exceed your expectations. Ramuc's total coatings program offers you quality products, superior surface and proven success for your pool painting project. Use Ramuc to beautify and protect your aquatic investment. Inspired by nature's flowing streams, Water Journey™ is a collection of four events providing different play experiences. Whether it's a single event or multiple events connected together, Water Journey creates vibrant spaces, inviting everyone to play, socialize or just contemplate. The Defender Regenerative Media Filter (RMF) filters out particulates down to 1 micron, reduces water consumption and energy costs, and takes up less space than traditional sand filters. So how do you improve the aquatic industry's best water filtration system? Add an intuitive graphic control system with advanced data logging, automated capabilities, remote monitoring and intersystem connectivity. Pentair's BioShield™ CLP UV System offers swimming pool owners cost savings by reducing chemical usage and simultaneously improving both the air and water quality of swimming pools. UV secondary disinfection systems offer aquatic facilities an alternative to many of the chemicals normally purchased to ensure clean, clear swimming pool water. UV also provides instant protection against chlorine-resistant microorganisms such as Giardia and Cryptosporidium. Ultraviolet light is healthier for swimmers, the environment and your facility's bottom line. ControlOMatic offers a new "free chlorine" colorimetric controller sensor that eliminates fluctuation levels in sanitizer due to ORP changes, especially in salt pools. The "PW-Free" TrueDPD takes the guesswork out of having to "hand-measure" free chlorine using proven DPD reagent technology. DPD technology is recognized as one of the most accurate testing methods and the TrueDPD ensures that all your measurements will always be accurate. Some health departments allow measurements from an automated colorimetric measuring system, replacing required manual measurements.